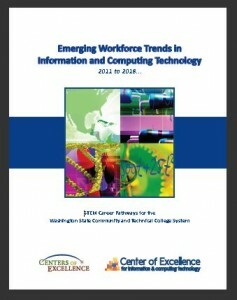 The Emerging Workforce Trends in Information and Computing Technology 2011 to 2018…: STEM Career Pathways for the Washington State Community and Technical College System report is available for a free download. Click on the report’s cover to start the download. Please email maureen.majury@bellevuecollege.edu if you have any questions. Each Washington State Community and Technical College workforce dean/vice-president received a complimentary copy in March 2011.